Fall is the perfect time of year to upgrade your HVAC system. A new unit will keep your home cozy, and some models will even cut the cost of your utility bills. The Mitsubishi Electric Diamond™ Contractors at Chesterfield Electric & HVAC in Burlington County, NJ, are offering a special rebate on Mitsubishi Electric® units. Here’s why it pays to act fast. Why Upgrade Your HVAC System in Autumn? Stay Comfortable: The HVAC system keeps your home at a toasty temperature throughout the winter season. When well-maintained, it also purifies the air, preventing asthma flare-ups, and allergy issues. Reduce Bills: With their zoning capabilities, these units also operate more efficiently and will lower your monthly utility expenses. Since homeowners can opt to only heat the rooms they use, it’s easy to conserve energy and minimize your carbon footprint to help the environment. Enjoy Flexibility: During busy times of the year, such as the holiday season, you’ll likely have guests staying in your home. During their stay, you can heat those otherwise unused rooms and return to the regular heating routine after they leave. 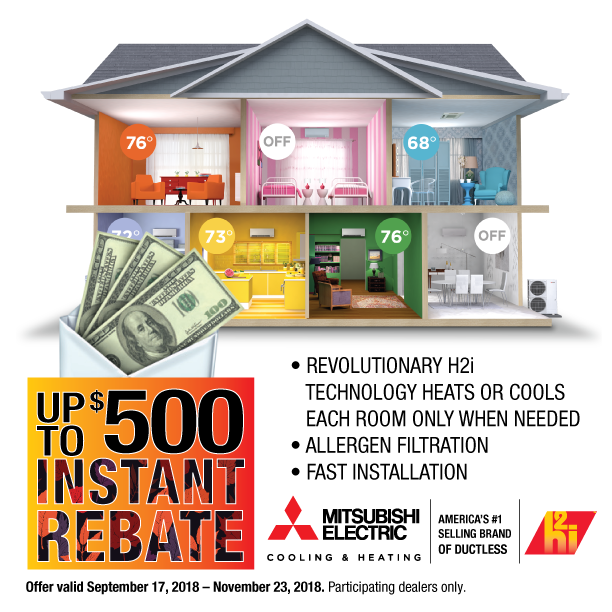 From September 17th through November 23rd, cash in on up to $500 instant rebates on Mitsubishi Electric systems from Chesterfield Electric & HVAC. The approved Mitsubishi Electric Diamond Contractors will outfit your home with a dependable HVAC system at a fraction of the cost. Multiple systems per home may qualify with prior approval. "So grateful for the great work done by Chesterfield Electric & HVAC, replacing my heater with a very energy-efficient model at a reasonable and fair price. John was very professional and explained everything when providing the estimate. Martin and other employees were definitely hard workers, leaving the area very clean when they left. I am very happy with the work, my purchase, and the efficiency of the new heater. Highly recommend Chesterfield Electric." – Dawn S.
Contact the Team Today to Take Advantage of the Deal! Don’t miss out on this one-of-a-kind opportunity. Get in touch with Chesterfield Electric & HVAC of Burlington County, NJ, as soon as possible. Call (609) 534-3143 to speak with a representative about investing in a Mitsubishi Electric HVAC system and make an appointment for installation. Visit them online to learn more about specials and services.